UEFA's headline for this reads "History and form favors Bayern." Yeah, thanks. In many ways, this is just a little hurdle before Arsenal's run-in, the "10 Games That Will Define The Universe"™. How much can Arsenal really expect from this tie, away from home and needing to score three? Their expectations are such that their #1 goalkeeper is being held out to rest. As such, there really isn't much to say in this preview that hasn't been said already. But, I promise I'll come back strong at the weekend. I've got good plans. Accumulation Trouble: Koscielny, Cazorla, Vermaelen, Arteta, Podolski, and Ramsey each face a one match ban with their next yellow card. The good news is that Kieran Gibbs is back from his thigh injury, but the bad news is DEAR GOD, JACK, NO! NOOOOOO! TAKE ME INSTEAD! Jack Wilshere will be out "three weeks" with an inflamed ankle. It's not the same ankle that caused him to miss all of last season, which is a relief, but you also never like to hear the phrase "three weeks" when it comes to Arsenal injuries. Is that three weeks on the Gregorian calendar or is three weeks on the Diaby calendar? Speaking of Diaby, he's still questionable with what I believe was a calf injury. He's in the squad but faces a fitness test. Lukas Podolski has been carrying a knock, which would explain why he's been limited to cameo appearances off the bench; he does not make the trip. And, of course, Nacho Monreal is unavailable, as he is cup tied. The surprise of the squad news, as alluded to earlier, is that Wojciech Szczesny is being left behind to rest. I think that pretty much speaks for itself in terms of how much faith Arsene Wenger has in getting a result in Munich. Accumulation Trouble: Dante and Martinez each face a one match ban with their next yellow card. There's some good news for Arsenal in terms of who could be missing for Bayern Munich. Jerome Boateng serves the second of his two match ban for his Matchday 6 red card. Bastian Schweinsteiger will miss this match due to yellow card accumulation. Frank Ribery injured ankle ligaments at the weekend against Dusseldorf and will miss out. 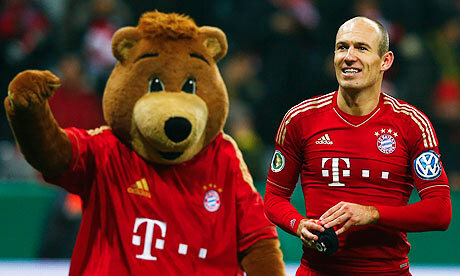 Arjen Robben did not play at the weekend due to a calf problem and faces a fitness test today. we get to use the dinosaur. It's hard to talk about Arsenal's form because, well, they have not played in 10 days. They say form goes out the window in derbies, so how much does losing 2-1 to your bitterest of bitter rivals contribute to the lack of form Arsenal have right now? Ultimately, it feels like you have to take this match as a one-off, hope to gain some sort of momentum from a positive display, and then take it from there for the rest of the league run-in. As for Bayern Munich, they are continuing to bend everyone over the proverbial barrel. They are 20 points clear of Dortmund at the top of the Bundesliga. Since we last saw the Bavarian side, they beat Dortmund 1-0 in the German Cup (DFB-Pokal) quarter-finals, they beat Werder Bremen 6-1, Hoffenheim 1-0, and Fortuna Dusseldorf 3-2. They have still lost only twice this season, across all competitions, while drawing four, and winning 30 (31, if you count the DFL-Supercup, the German equivalent of the Community Shield.) That's a win percentage of nearly 84%. in Europe since 2004, Nicklas Bendtner had a hat trick. I'm not going to go into ridiculous detail about Arsenal's history against Bayern Munich here as I normally would, because you can just read the first leg preview and that tack on "miserable 3-1 home defeat" to the list of matches. What we should talk about here are Arsenal's previous attempts at overcoming first leg deficits in Champions League knockout play. Since 2003/04, when the Champions League switched to the 16-team knockout phase set-up, Arsenal have lost the first match of a two-legged tie six times, including this year. In the five previous occurrences before this year, Arsenal have come from behind to win the tie only once, against Porto in 2010, when they overturned a 2-1 deficit by winning 5-0 at the Emirates. Only twice in the Champions League have any team overcome losing the first leg at home: Ajax did it 1996 and Inter Milan did it (against Bayern Munich) in 2011. Arsenal have only won three times in 12 matches on German soil. Bayern have only lost once ever against an English opponent at home (technically their Final loss to Chelsea last year doesn't count in that statistic.) In 1992, Bayern lost 2-1 to Norwich City in the UEFA Cup. I can't think of a caption. The referee is Czech Republic based engineer Pavel Kralovec. An engineer by trade, Kralovec has been a UEFA official since 2004, but only worked his first Champions League match on Matchday 2 of last season. This is his first time being involved with either Arsenal or Bayern Munich. As for other teams from their respective countries, Kralovec has worked Manchester City matches in the Champions League twice: a 2-1 City win over Villarreal last season and a 1-1 draw with Dortmund this season. That Dortmund match was the only German match Kralovec has done in the Champions League to date. This is his seventh UEFA Champions League match, overall. Real Madrid wins 3-2 on aggregate. Borussia Dortmund wins 5-2 on aggregate. Paris Saint-Germain wins 3-2 on aggregate. Juventus wins 5-0 on aggregate. Galatasaray wins 4-3 on aggregate. Barcelona wins 4-2 on aggregate.